A driver with the San Francisco ridesharing service Uber was arrested on suspicion of vehicular manslaughter for striking and killing a 6-year-old girl in the city's Tenderloin neighborhood on New Year's Eve, police and company officials said Thursday. 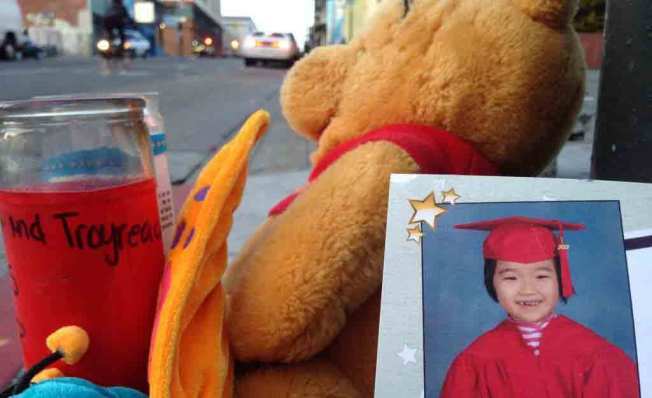 Syed Muzaffar, 57, of Union City, was arrested following the death of 6-year-old Sophia Liu, who was struck as she crossed the street with her mother and brother at Polk and Ellis streets at about 8 p.m. Tuesday, police said. Muzaffar was turning right when he struck the victims, who were walking in the crosswalk, police said. He was booked into custody on suspicion of vehicular manslaughter with gross negligence and failure to yield to pedestrians in a crosswalk and posted bail at about 11 p.m. Wednesday, sheriff's spokeswoman Susan Fahey said. Uber, which matches riders to private cars via a smartphone app, released a statement Thursday confirming that Muzaffar was a driver for the company and said it has deactivated his account. Uber officials said he did not have a passenger in his car at the time of the collision. "We again extend our deepest condolences to the family and victims of this tragic accident," the company said in a statement. Legal expert Steven Clark told NBC Bay Area that a court could still hold Uber responsible. Nicole Schneider, executive director of Walk SF, says the bigger responsibility lies with city leaders to build safer streets. "This particular intersection at Polk and Ellis should be receiving improvements,” Schneider said, “and it will take city leadership to prioritize these sorts of projects that could have prevented a needless death." The pedestrian death was the second in San Francisco on New Year's Eve. Earlier in the day, 86-year-old Zhen Guang Ng was fatally struck at Naples and Rolph streets in the city's Crocker-Amazon neighborhood. Giampaolo Boschetti, 69, of San Francisco, was arrested on suspicion of vehicular manslaughter with gross negligence and failure to stop at a stop sign in connection with Ng's death. Boschetti was also released from custody on Wednesday after posting bail, Fahey said.